ORANGE BEACH, Alabama -- Developers of the proposed 37-story Ascension and 36-story Grace condominium towers this week cleared the first of what will be many hurdles in their quest to build the second- and fourth-tallest buildings in Alabama. Amid a standing-room-only crowd at Monday night's Orange Beach Planning Commission meeting, more than 40 people spoke in favor of the Gulf-front condos that would be built on 6.63 acres near the intersection of Perdido Beach Boulevard and Ala. 161. Only three people voiced concerns about the development during a public hearing. On the table was a request to approve of the master plan and the preliminary planned unit development zoning that would allow GCOF Orange Beach Gulf Front LLC to exceed the allowable 26-floor limit for each tower in the BR-2, beach resort zoning district. The planning board voted unanimously to recommend City Council approval of the requests. At 469 feet, Ascension would become the second-tallest building in the state behind Mobile's RSA Tower at 745 feet. Grace would take the fourth spot at nearly 449 feet behind the Wells-Fargo Tower in Birmingham at 454 feet. 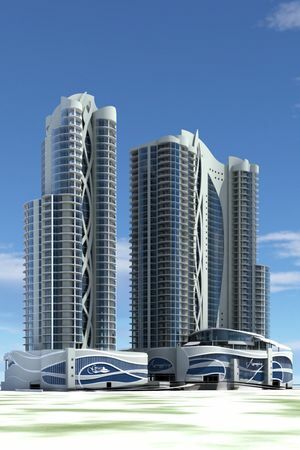 At present, the tallest building on the Alabama Gulf Coast is Turquoise Place at 377 feet, which stands less than a mile west of the proposed site. Monday's discussions about Ascension and Grace revolved around key issues of traffic, height and parking. With the flexibility of PUD zoning, Battle Plan Capital CEO Nathan Cox, who represents GCOF, worked with city planners, the Alabama Department of Transportation and project architect Forrest Daniell of Daphne-based Forrest Daniell and Associates to create an access road that would run along the north side of the towers, parallel with the beach highway. The private road would provide access to the traffic signal across from the Publix shopping center at the Hampton Inn and the other signal at the Ala. 161 intersection. Kit Alexander, the city's engineering and environmental services director, said the previously approved project at the same site, the 36-story Mandolay Beach project that ultimately fell victim to the Great Recession in 2008, split the property between the two access points. "We feel this is a better scenario with a frontage road along the entire front and there's really no other way to develop this property with a better access management plan," Alexander said. "The project you have in front of you from a unit and traffic impact standpoint is no worse than what can be developed by right under the BR-2 zoning district -- 42 units per acre is allowed under the BR-2 zoning district. They are proposing two less than what would be allowed by the 42 units per acre. So if this was not approved, the development the planning commission would be required to approve, if it complied with all the BR-2 criteria, would have the same traffic impact on this segment of roadway." Another key factor in the planning board's approval of the project was the fact that Ascension's 200 units would be restricted to at least 7-day rentals and Grace's 76 units would have 30-day rent restrictions. The longer turnover times are expected to help limit the amount of traffic on the highways as opposed to unrestricted condos where units can turnover multiple times in one week. New city zoning rules helped nip potential parking issues in the bud, having learned the hard way that one condo unit alone could bring upward of four SUVs. Multiply that by thousands and the city has experienced stressful parking issues during the peak vacation months with tourists parking wherever they could, including on the side of the state highway. The new criteria ties parking spaces to the number of bedrooms in a development as opposed to units. Parking played such a prominent role in the Ascension and Grace towers that the project was delayed from fall planning board meetings and redesigned to add an additional level of parking to each building. During his presentation to the planning commission, Cox said he wanted the towers to be part of the solution and not add to the problem. Initially the project's traffic study showed the need for 637 spaces between the two condos but that was boosted to 829. Ascension would have 615 spaces, covering six floors, for 200 units and Grace would have 214 spaces, covering 5 floors, for 76 units. As another incentive to keep traffic down, the project will include pedestrian connectivity. "This is where our renter, owners, etc. will be encouraged more to get out of their unit and walk over to the commercial shops, restaurants, pharmacy, grocery stores as opposed to getting in a car," Cox said. Cox also focused on the elephant in the room. "For the record, I know we're over the height allotment," he said. "I know it, Facebook knows it, AL.com knows it, my kid's kindergarten class knows it. It's evident, I get that. So, you know, the question has been posed to me, 'You know you're going over the height requirement, why would you intentionally break the rules? Why would you start from day one with a project that is not allowed?' Well, the answer is I told you from the start our sole driving force about doing this project is to create the best project possible. And how are we able to create the best project possible? It was to go higher than 26 stories. "And that's the answer. That's the truth. You know, that has been why we've done what we've done." Having slimmer buildings takes up less ground and provides spacing between the buildings while under the "by right" alternative, the parking decks would merge across the entire front of the buildings, which would have a stacked, wedding cake look. Daniell said while he and Cox were designing the building the 600-foot-long parking deck and the stacked or Ziggurat look were the reasons they shifted to a PUD plan. "We didn't feel like the portions, the stair-stepping and this huge parking deck were what the city would want," he said. Cox said he has called Orange Beach his second home "for as long as he could talk." His father, Alan Cox, developed eight condos on the coast. "I want to see what's best for all of us here and I really do mean that," Cox said. "Height is the true issue that we're here to talk about tonight but what are we getting in exchange for going over the height barrier? First off, I think we're getting the two most amazing buildings the Gulf Coast has ever seen. And am I biased? One hundred percent. But I think they are truly amazing. The job Forrest has done has been nothing short of spectacular. ... And, second, you know density. We could max out density at 278 units. Today, we're at 276." Turquoise Place, which was also designed by Daniell, was used a springboard for the new towers. "We used Turquoise as kind of our template and said we want to meet or exceed everything that they have created at Turquoise," Cox said. Turquoise Place's two towers, the last of which opened in 2009, set the standard for high-end high-rises on the Gulf Coast. Prior to the real estate market collapse, units in the curvy, turquoise-color glass towers were going for well over $1 million. Stepping up his design of Turquoise, Daniell said Ascension and Grace would be landmarks that will define the gateway to the beach and create a unique skyline. "It will bring Orange Beach more prestige and recognition as a tourist destination," he said. Ascension will be made up of 140 four-bedroom units and 60 five-bedroom units. Amenities will include multiple ground-level pools with two water slides, one 16 feet high and the other over 20 feet. Grace will have 18 three-bedroom units, 56 four-bedroom and two five-bedroom, 6,500-square-foot penthouse units with an office and a full-blown media room. The ground-level amenities would feature a large pool and 18-foot slide. The amenities don't end there. "Both of these towers have a unique feature on the amenities levels on the six and seven floors," Daniell said. "We have a lazy river that goes all the way around the tower. So it's kind of a cool thing that I hadn't seen before." The sixth floor of Grace would feature another pool in addition to the lazy river. On the seventh floor of Ascension, the lazy river would stretch 930 feet around the building and would include a tiki bar, and another pool would feature two slides. Each tower has a distinctive helix design running up the outside of the elevator shaft, facing the beach highway. During his presentation Monday, Daniell called it the "seaweed feature" that will have a unique nighttime display. "Most of the time you paint the elevator shaft black and at night all you see is the elevator going up and down," Daniell said. "What we intend to do here is light up the shaft, paint it white and light it up with lights that will change color slowly to look like you're underwater. And they'll kind of help silhouette the seaweed structure as you go up the building. So I think it will be a pretty cool nighttime effect." From residents to business owners to other developers, an overwhelming majority of the packed council chambers supported the two-tower project. Donna Worley of Orange Beach said she's seen all of the past proposals for the site, "but nothing has been as beautiful as this." "I think we're blessed as a community to have local developers and a local architect that have our best interest at heart," she said. Will Watson with HOAR construction said as a national contractor the company sees projects all along the coast from Biloxi, Mississippi, to Naples, Florida. "Nowhere is there a project like this in any form of development on the Gulf Coast," he said. "The fact that it's here in Orange Beach, Alabama, is exciting to me." Longtime resident Cecil Young said he was opposed to the project. He said the city should stick to the established 26-story height limit. "It's all what we've voted on and everybody has been going along with it," Young said. "And along comes the men with the deep pockets. So it doesn't matter and we want to know when is it going to stop? Now y'all go ahead and approve this tonight then somebody will come along and want a 40 or 50." Orange Beach attorney Bert Taylor spoke for the majority of owners of the former Against the Wind condo property, which is adjacent to the proposed Grace site on the east side. He pointed out ongoing negotiations with Cox about access issue to the property. Chairman Robert Stuart said Monday's request was for preliminary approval and the two parties had time to work it out. A separate access issue on the project's west side was broached by Innisfree Hotels, which owns the Hampton Inn, in a letter that was mentioned during the meeting. Alexander told board members it didn't warrant pushing off the vote. Two other residents, one opposed and one undecided, raised concerns about pedestrian safety and suggested that the city look into elevated walkways over the beach highway. Richard Lamar of Gulf Shores said the towers would set Orange Beach apart from competition on the Gulf and would "bring the next generation of buyers here." Orange Beach resident Larry Wireman, who developed Turquoise Place and Caribe, said Cox and GCOF are offering the city "a goose that lays the golden eggs." "I have studied the plans on this project," Wireman said. "I have studied the layouts, the floor plans; this is a fantastic project. It's going to be something else." After the meeting, Cox said he was encouraged by the turnout and the board's unanimous vote in support of the project. "Obviously, I'm very, very excited," he said. "I think it says a lot about the leadership of the city wanting to continue to progress, head in the right direction and continue to enhance our reputation as thee destination spot to be along the Gulf Coast." But, he said, there's still a lot of work ahead. "The approval is just a first step and we still have got a lot of work on our end to make this happen," Cox said. "But we're real excited about the direction the market is heading and I think a project like this has got a good chance of being successful." The next stop for the proposal will be in front of the City Council either in late February or early March, where a public hearing will be held on the preliminary planned unit development plans and then a council vote. If approved, Cox would then have to submit for final PUD approval and go before the planning commission as well as the council again, which would take about three months. You are just a few clicks away from relaxing on the beautiful beaches Gulf Shores Alabama has to offer. Our team of experienced agents will make your home search as enjoyable and stress-free as possible, while delivering the results you demand and deserve. We want to do our part to strengthen the Orange Beach and Gulf Shores communities by supporting local charities.